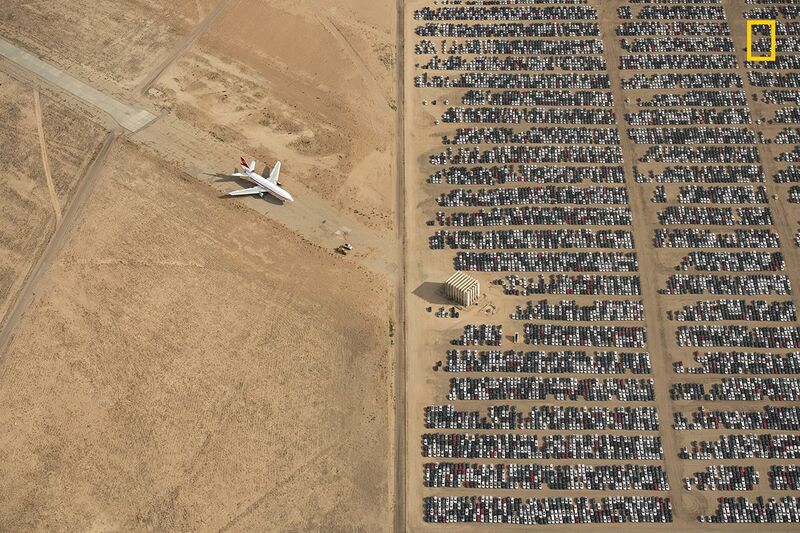 A photograph of thousands of recalled Volkswagen and Audi cars sitting idly in the Mojave Desert has been chosen as the winner of the 2018 National Geographic Photo contest. The photo, titled Unreal, was captured by concert violinist and flight instructor Jassen Todorov of the United States, who wins the grand prize of $5,000. In September 2015, the U.S. Environmental Protection Agency (EPA) found that the German car manuafacturer had intentionally programmed Volkswagen and Audi models manufactured from 2009 to 2015 to cheat emissions tests. Following the scandal, Volkswagen recalled millions of cars. This year's National Geographic Photo contest attracted nearly 10,000 entries from across the world in three categories–People, Places and Wildlife. Todorov's image was the winner of the Places category. Pim Volkers of the Netherlands won first place in the Wildlife category for a photo of wildebeest crossing the Mara River in Tanzania. 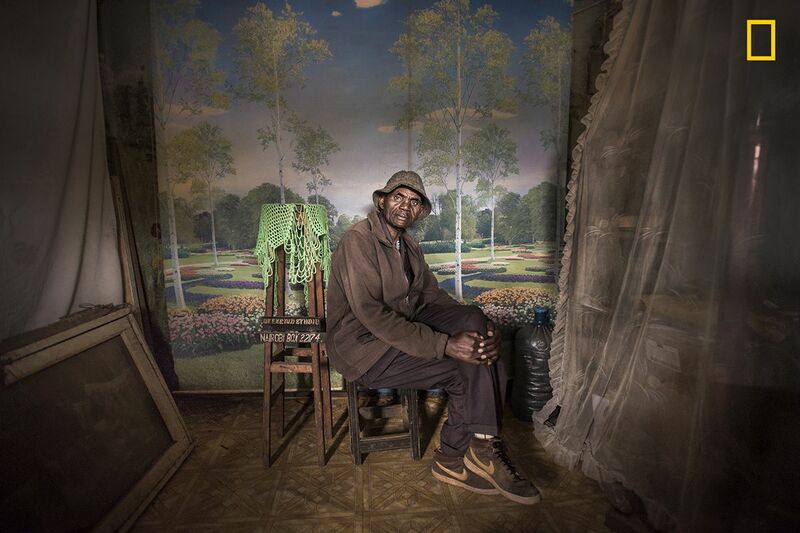 Mia Collis of Kenya won first place in the People category for a portrait of David Muyochokera on his last day working at his studio in Kibera, Nairobi. The photos were judged by a panel of National Geographic photo editors. 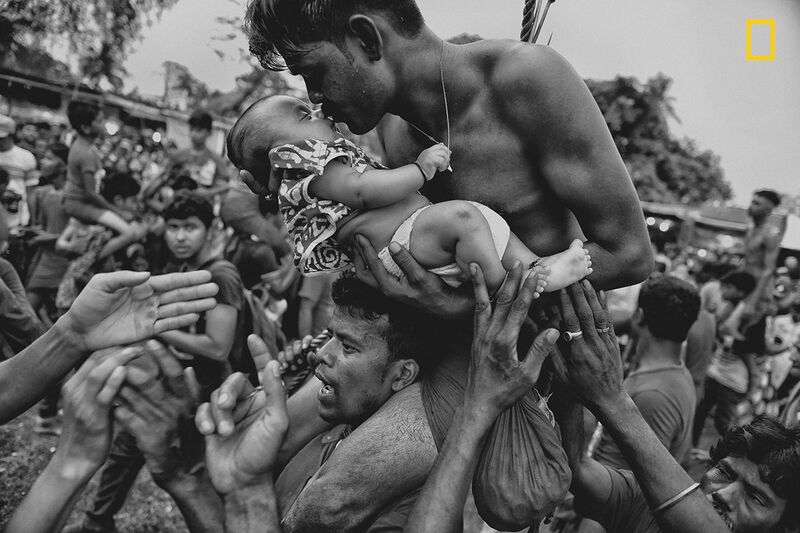 Newsweek publishes this year's grand prize winner and the top three images in each category. All of the winning photos, along with the honorable mentions, may be viewed at natgeo.com/photocontest. This article has been amended to reflect a clarification issued by National Geographic. 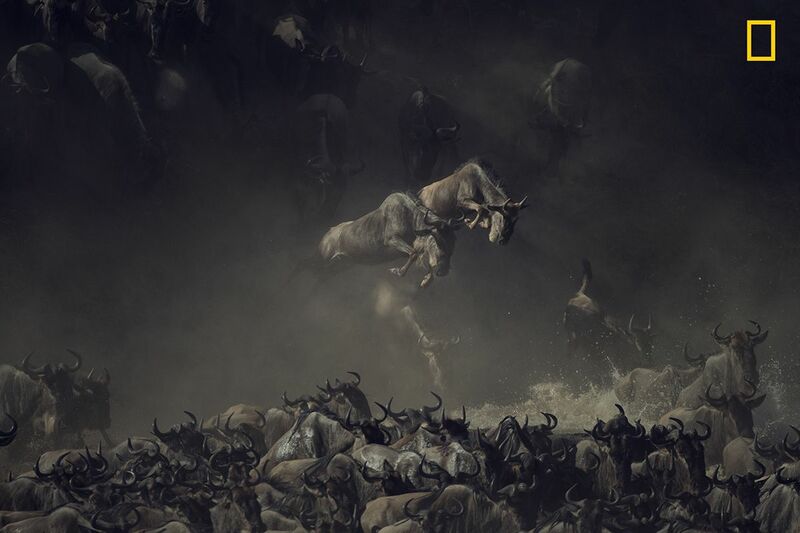 "It was early morning when I saw the wildebeests crossing Tanzania’s Mara River. The layering of dust, shade, and sun over the chaos of wildebeests kicking up water gives this picture a sense of mystique and allure. It’s almost like an old painting—I’m still compelled to search the detail of the image to absorb the unreal scene." "A few miles from Qaanaaq (Thule), Greenland, I was on a hike in search of musk oxen when I came upon a group of them. This ox was running on a hillside in deep snow, which exploded underneath it—an amazing sight. The photo came together in a few seconds. I was lucky enough to be at the right spot to observe them frolicking, and then I had the incredible experience of watching them closely for about an hour. 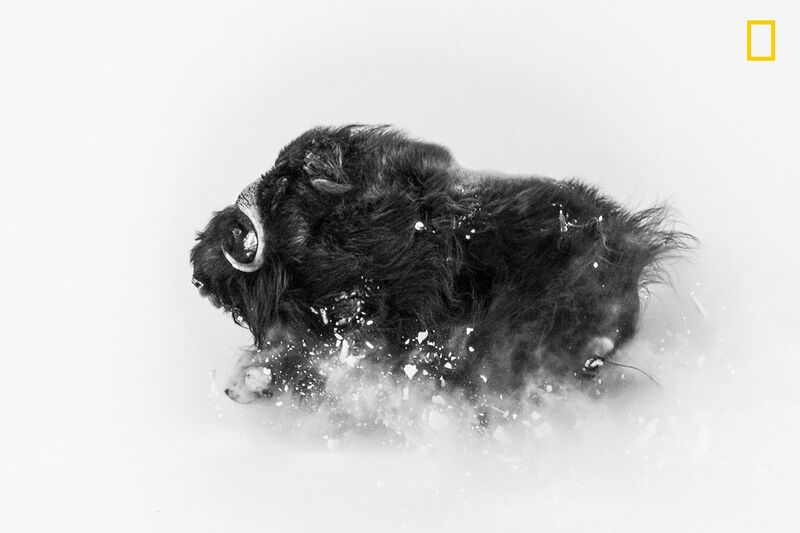 I love photographing musk oxen against the wintry landscape: They’re extremely tough Arctic survivors. This photo shows their beauty and their power—and the snow they deal with for about eight months of the year." 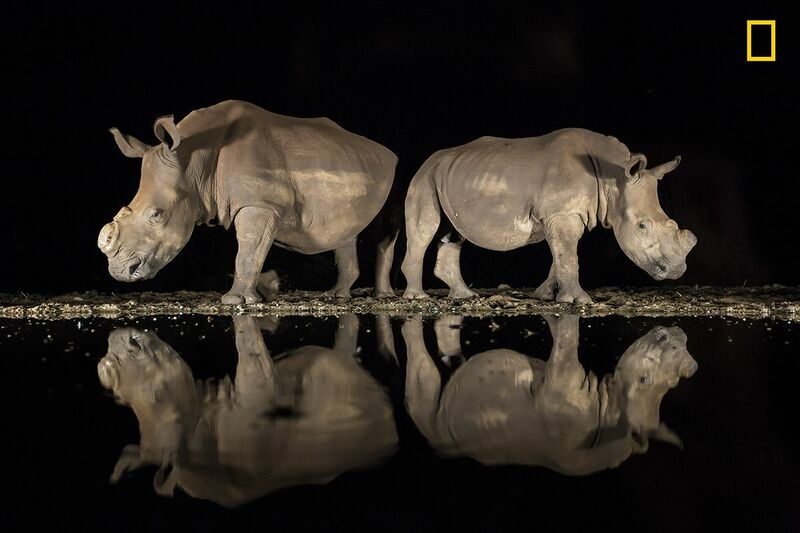 "As the late-night hours ticked by and my eyelids grew heavy, two southern white rhinoceroses appeared silently from the shadows to drink from a watering hole in South Africa’s Zimanga Game Reserve. On alert, they stood back to back, observing their surroundings before lowering their heads. I felt privileged to share this moment with these endangered animals. While I was well prepared technically, with my camera set correctly on a tripod, I underestimated the emotional impact the magnificent beasts would have on me. I had photographed them months earlier, and now both rhinos sported a new look: They had been dehorned to deter poachers. I had heard about this development but had not yet seen them. I was full of emotion—and horror—that poaching had such a devastating effect. It must have been a hard decision to dehorn their rhinos, and I am grateful for the reserve’s efforts." 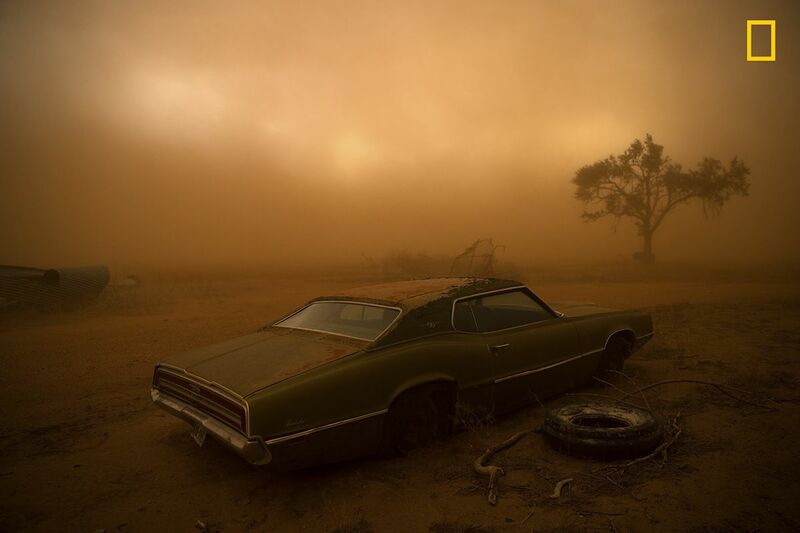 "A rusting Ford Thunderbird is blanketed by red dust from a supercell thunderstorm in Ralls, Texas. The dry, plowed fields of the Texas Panhandle made easy prey for the storm, which had winds over 90 miles an hour ripping up the topsoil and depositing it farther south. I was forecasting and positioning a team of videographers and photographers on a storm chase in Tornado Alley—this was our last day of a very successful chase, having witnessed 16 tornadoes over 10 days. The target area for a storm initiation was just south of Amarillo, Texas. Once the storm became a supercell, it moved southbound with outflow winds that were easily strong enough to tear up the topsoil and send it into the air." "While on assignment for Der Spiegel, we made a road trip through Syria to document the current situation in major cities. When I first entered the Khalidiya district in Homs, I was shocked. 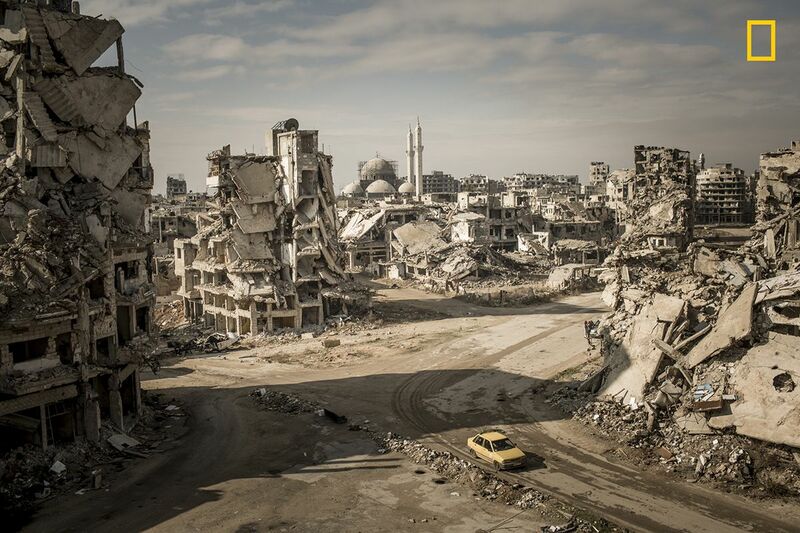 I hadn’t seen such large-scale destruction before, and I had been to many destroyed cities. The area around the Khalidiya district was extremely quiet. No city sounds, cars—nothing. Only the chirping of swallows and the wind. We walked down the streets of Khalidiya, but the destruction was so large scale that you couldn’t have the big picture from the point of view on the street—you could only manage it with a view from above. To make this image, I asked a Syrian soldier in charge of the area if I could climb onto a ruin. The soldier agreed, allowing me to climb at my own risk. I climbed up the ruins of a former house—which was full of improvised explosive devices—and took the picture. I was very lucky to take the picture when I was on the rooftop. Without any sign of life, it would have been a dead picture. I can recall the memory vividly." "Japan’s Blue Pond in Biei-cho, Hokkaido, has become very famous for attracting tourists from around the world. It is surrounded by beautiful mountains and trees. This pond, frozen during winter, was artificially made to prevent river contamination from the nearby active volcano, Mount Tokachi. The accumulated pond water contains high levels of minerals, such as those containing aluminum. The alluring view of the blue pond can take one’s breath away. To make this image, I made the exposure longer to capture the way the snow was falling. 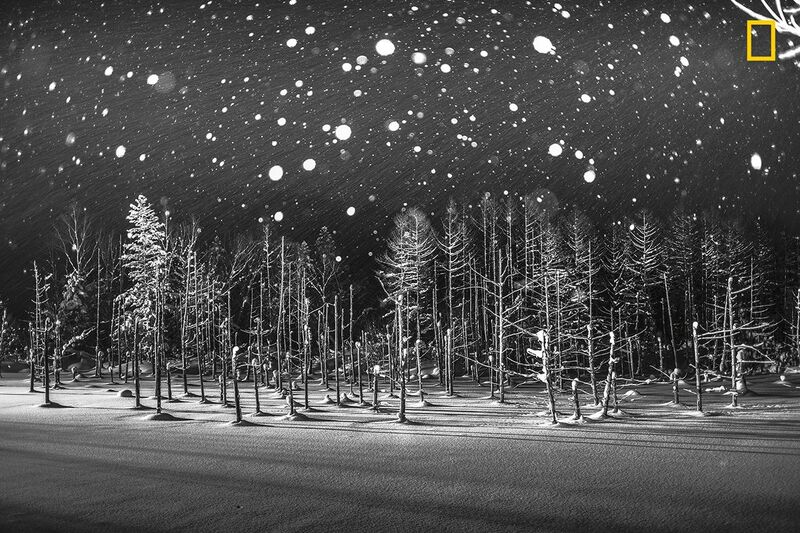 At the same time, I lit up the strobe for a moment to capture the snowflakes that are reflecting in the foreground. I took as many photos as I could and chose the one I thought had the best balance of the falling snow and the unfocused snowflakes. I wanted to express how time is created in just one moment and, by tying together these moments, history is made." "I was looking to do a series of portraits showing people wearing their Sunday best when I made this photo of David Muyochokera. It was taken on his last Sunday working as a photographer at Weekend Studio, in Kibera—a large shantytown in Nairobi, Kenya. My friend Peter, a local resident, had pointed me to the photo studio just as I was about to leave the area. It was a stunning space, with whimsical backdrops and natural light coming through the doorway. David had worked there for 37 years, but Weekend Studio was about to close permanently. Phone cameras were so common now, he said, and fewer people wanted studio portraits. David planned to retire and return home to the countryside. I was troubled by the studio’s imminent closure, so I eventually took over the rent. A portrait of David now hangs at Weekend Studio in his memory." 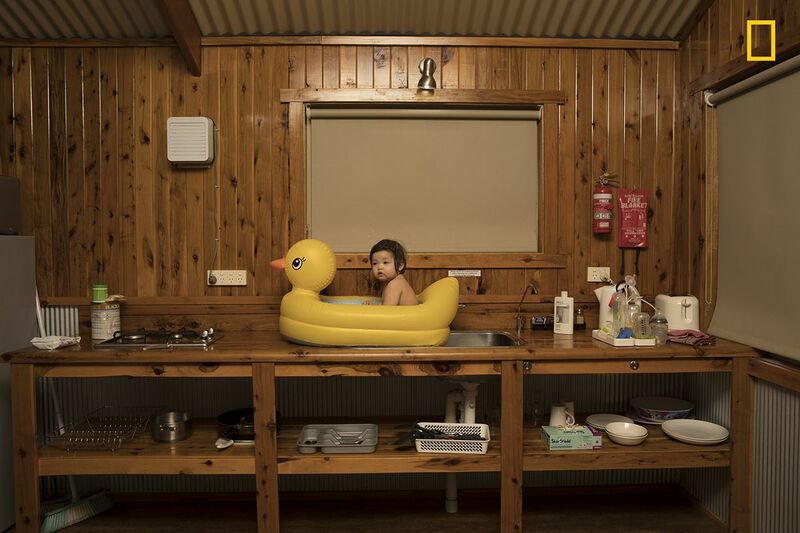 "On a family holiday driving from Sydney to Uluru, we stopped at a roadside motel in the small rural township of Nyngan, on the edge of Australia’s outback. The area is in the wheat belt, and it was unusually hot for that time of year—over a hundred degrees Fahrenheit and very dusty. Our daughter, Genie, is seen here enjoying a refreshing bath in a rubber ducky perched on the sink." "A Hindu devotee kisses his newborn baby during the Charak Puja festival in West Bengal, India. Traditional practice calls for the devotee to be pierced with a hook and sometimes swung from a rope. This painful sacrifice is enacted to save their children from anxiety. While covering the festival, I was able to view the religious practice from the perspective of Hindu devotees. I tried to capture the moment of love and bonding between a father and his child—and show a father’s concern for his little son."